Status: Framework completed. Various vehicles completed. 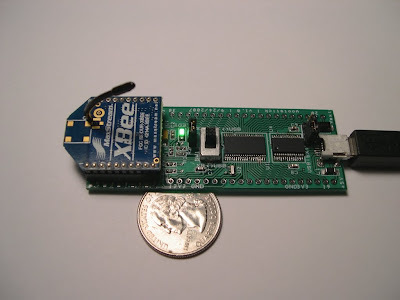 I've been building custom RC equipment since 2007, when I helped developed a 2.4GHz control system for 2.007: Design and Manufacturing I as part of my S.B. Thesis. Even though I've gained an appreciation for the quality of commercially available 2.4GHz systems, I still use my own RC hardware whenever I get a chance. Since the framework hasn't changed since 2007, it's mostly a plug-and-play solution that I can stick on any vehicle I want. The transceivers are simple and reliable XBee modules from Digi and the carrier board is a custom-designed microcontroller development board (...like an Arduino...) based on the MSP430F2274 or more recently, the STM32F103. Since each module can transmit and receive, I can also do data acquisition over the same connection. 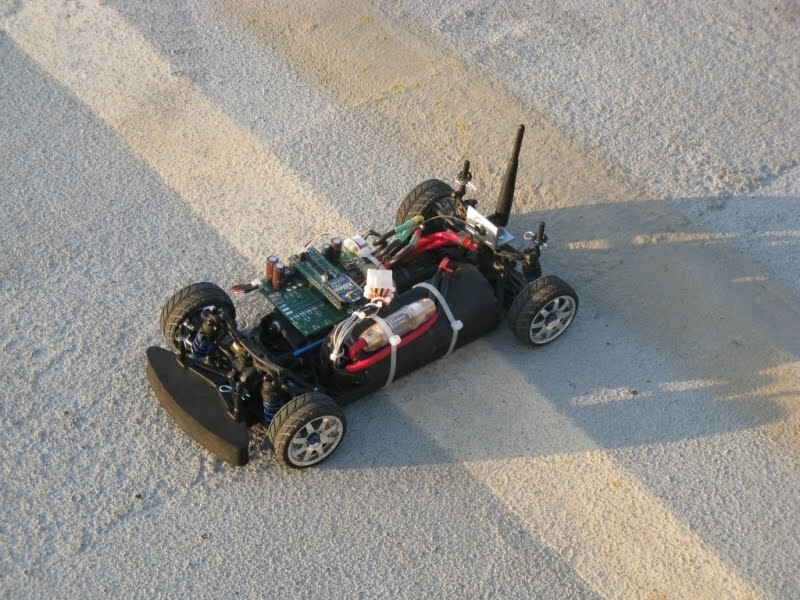 One module goes with the RC vehicle; the connects via USB to a laptop computer. Being tethered to a laptop has its disadvantages, but it also opens up the opportunity to use any USB controller as the input. 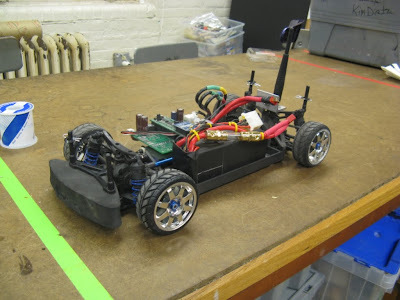 Of all the various vehicles I've worked on, this RC car is the fastest. Think about that for a second. I've done robots, scooters, go-karts, segways, generally things you ride on. But this tiny 2kg RC car with a $13 motor beats them all, hands-down. It does 0-30mph in 1.7 seconds and reaches a top speed of 45mph. That's breaking the speed limit on most Cambridge streets. The original build report and follow-up have all the details. Oh yeah, and I have the data to prove it. This odd-looking creature is Twitch, Jr. I built it after I saw this video of FIRST Team 1565's 2008 robot, Twitch. (Okay, so some years passed in between, but I always had it in mind as a potential project.) Here's the post archive. It's not as fast as the RC car, but it can do tricks.